If you are tracking clickthrus, events, conversions using Google Analytics here are a few tips, ideas and hints for tracking and then later on improving your webpage using Google tools : analytics, adwords and Google website optimizer. New to Google Analytics is something called event tracking. Google events are slightly different than goals in Google analytics and while Google suggests that you track using events – I could find no easy way / interface to see which keyword is generating a desired event – like a click thru or a sale with events. This leaves us with a doing both tracking events and generating goals to have the best desired result. Here are some ideas for best practices for click tracking on an affiliate website. 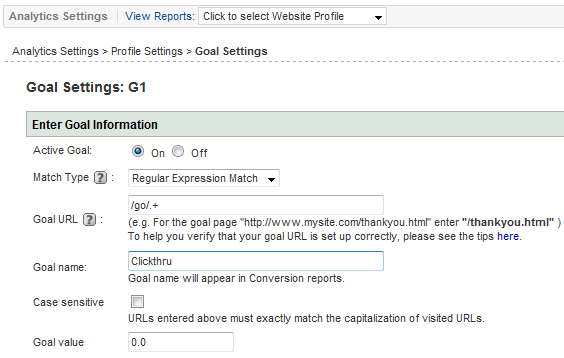 Setup goals for click thrus on Google Analytics – If you are following point number two above you can easily set a goal for all links that match /recommends/.+ , /go/.+ or whatever syntax you use. Install this tracking code to track all click that match your syntax. This kind of tracking code matches all outgoing links with the keyword /recommends/ and will generate a goal proivded you did the previous steps for 2 and 3. To change this syntax to another naming convention is easy enough. This code also generates both a goal and an event in analytics. [/cc] This just initiates an image pixel so that a conversion in adwords is generated. Stuck with how to setup a landing page ? Here is a simple optin idea for lead pages – landing page generator – very simple but you get the idea here or even better monitor adwords campaigns that are working with a tool like traffic travis. By implementing these tips you should be able to track and improve your webpage’s effectiveness with Google tracking tools. Leave a comment below if this helps you!